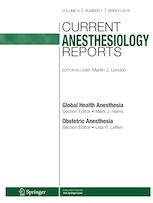 Current Anesthesiology Reports offers expert review articles on significant recent developments in the field. By providing clear, insightful, balanced contributions, the journal serves all those involved in the delivery of perioperative pain management. International authorities serve as Section Editors, choosing key topics for which leading experts contribute comprehensive review articles that emphasize new developments and recently published papers of major importance, highlighted by annotated reference lists. The journal spans the field, covering topics including ambulatory anesthesia, anesthesia and inflammation, anesthetic mechanisms, anesthetic pharmacology, cardiovascular anesthesia, critical care anesthesia, local anesthetic pharmacology, monitoring technology, neuroanesthesia, neuromuscular blockade, obstetrical anesthesia, pain mechanisms, pain therapy, patient safety, pediatric anesthesia, quality assessment, regional anesthesia, transplantation anesthesia and more.